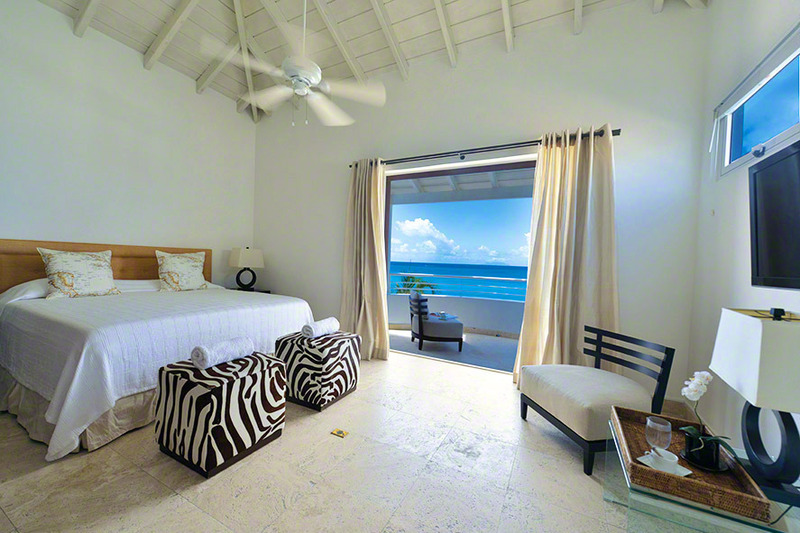 Villa Luna is a quiet oasis within the Shore Pointe beachfront villa community on the French/Dutch Border, in the town of Cupecoy. 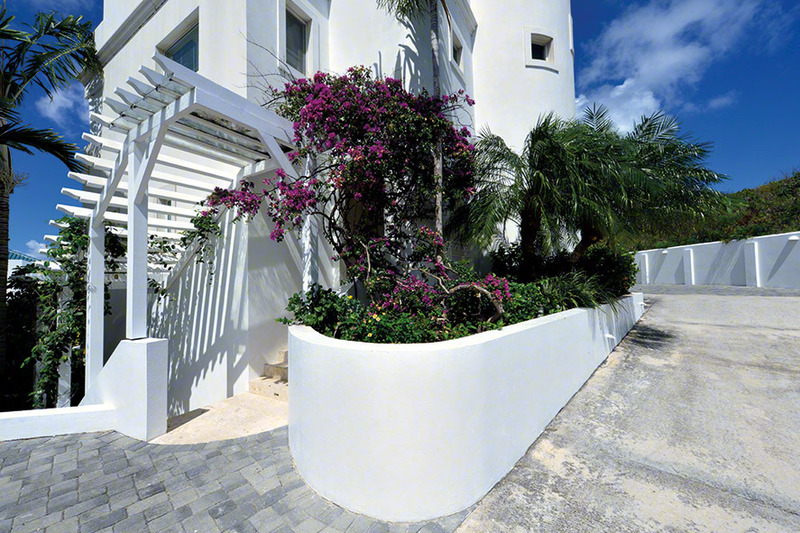 The all white villas make you feel as if you have landed in Greece and not St-Maarten. 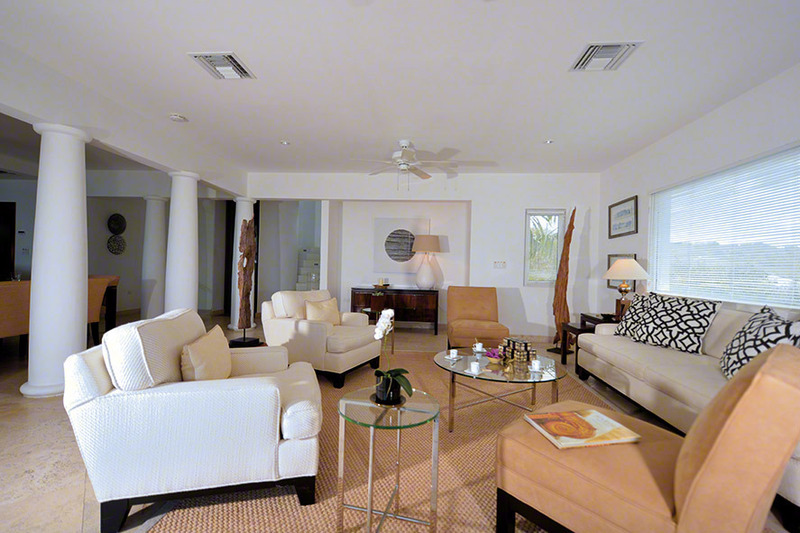 Villa Luna is set in the highest point of the community, giving it commanding views of the Caribbean Sea plus the neighboring islands of Saba, St Eustais and Nevis. 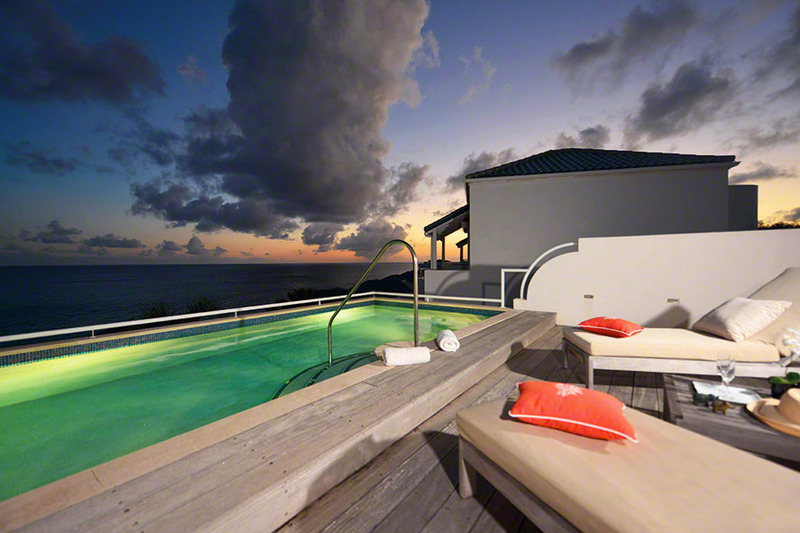 Sunsets and the moon and star filled night sky are simply brilliant especially from the unique roof top pool terrace. The entry to Villa Luna is tucked under a pretty pergola surrounded by tropical plantings. 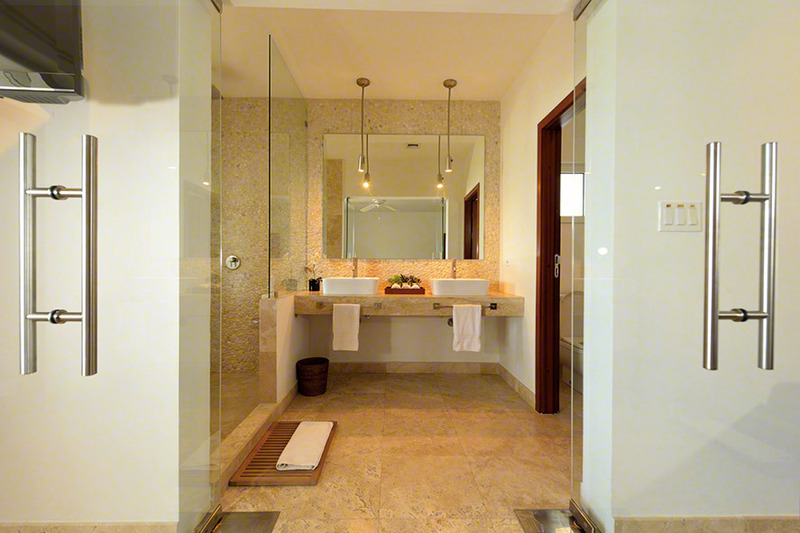 Its unique floor plan provides lots of privacy whether you are on a honeymoon or traveling with friends and family. 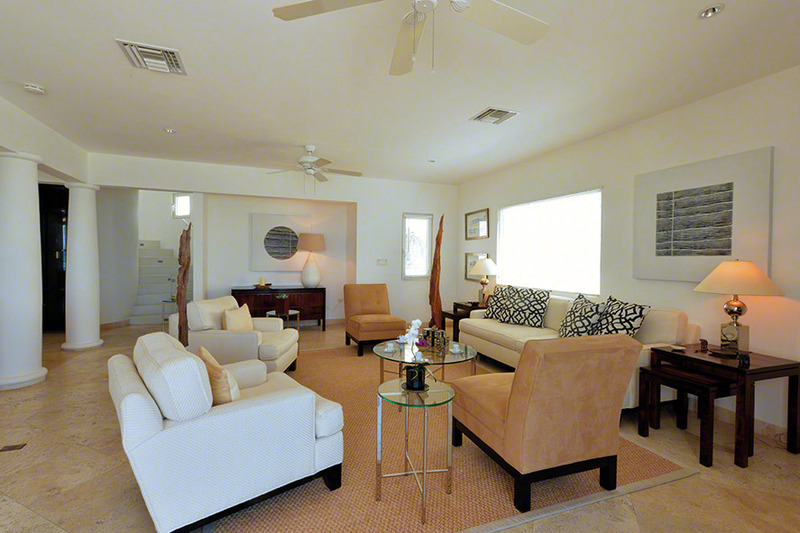 Split on three floors, you enter in the foyer where you will find two of the three bedrooms. 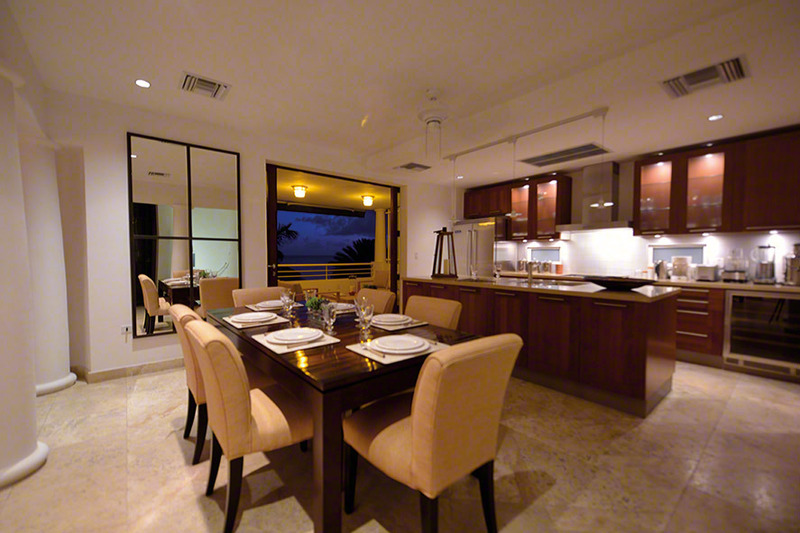 The second floor is the main living space including kitchen, dining and living while the top floor is saved for the master bedroom and the private pool terrace. Access to the other floors from the main entrance is either by a chic elevator or nautilus shaped spiral marble staircase. 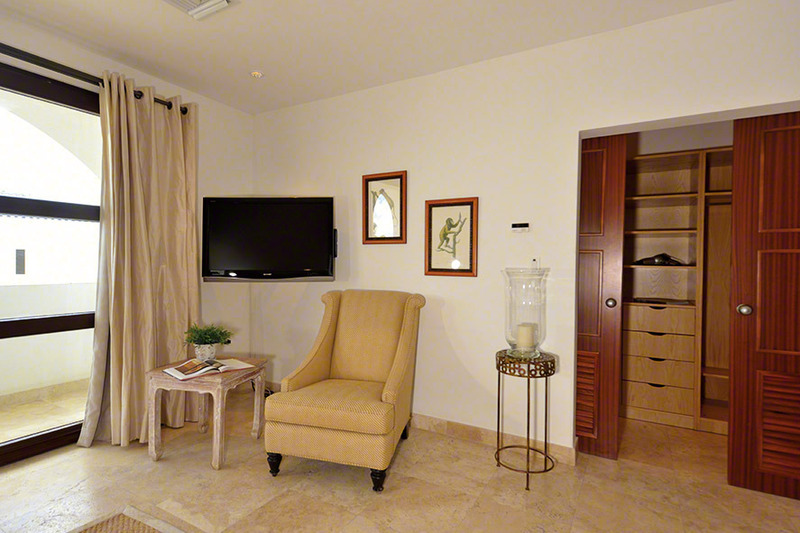 The two equal size guest rooms are off the main entrance; each with a private terrace, beautiful built-in closets and elegant spa style en-suite bathrooms with walk-in showers. The décor is chic elegant. 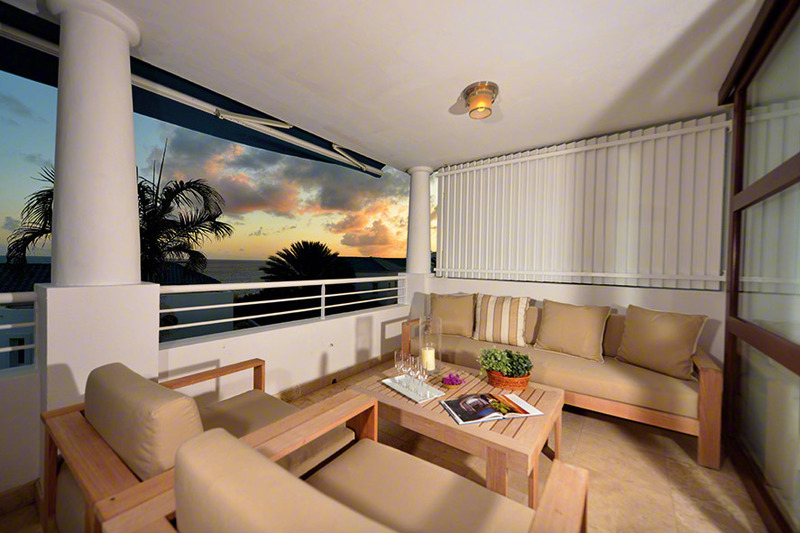 The main living space on the 2nd floor opens to the large terrace filled with comfortable seating for viewing the sunset. 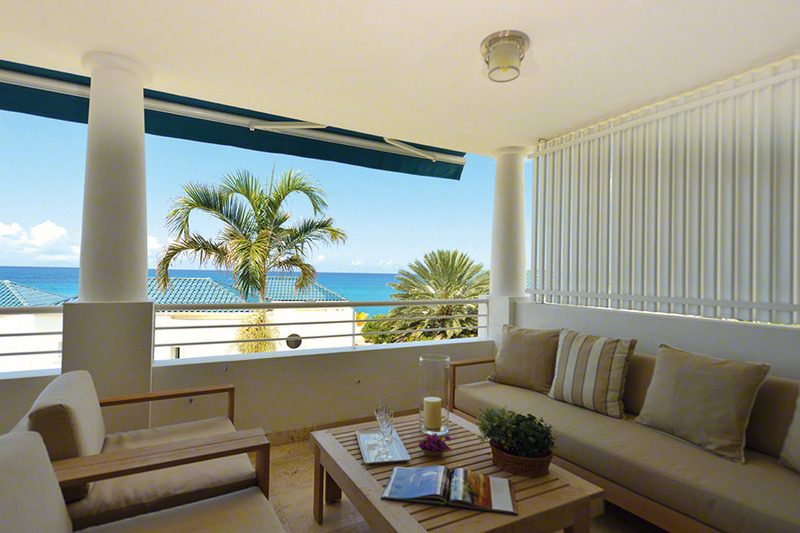 You look out over the blue tile roofs of Shore Point and out to the brilliant blue sea and sky. 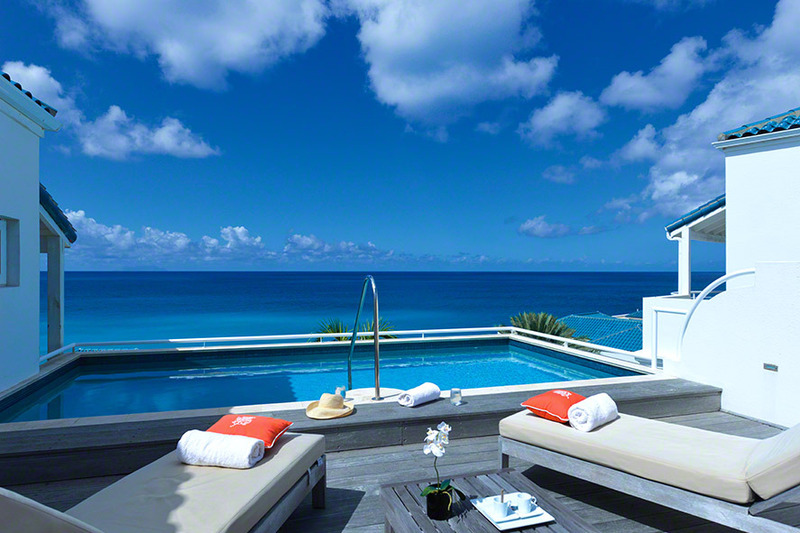 The top level is a private oasis. 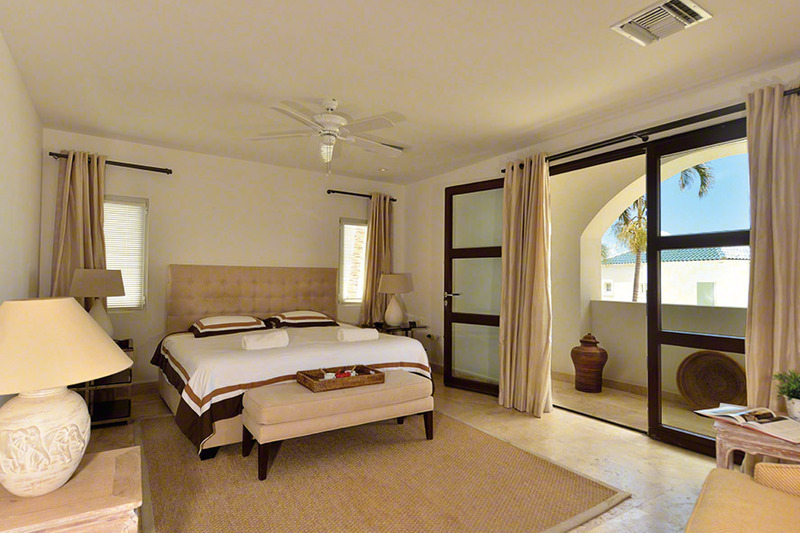 On one side is a large and elegant master bedroom, with en-suite spa style bathroom, in serene whites and creams. 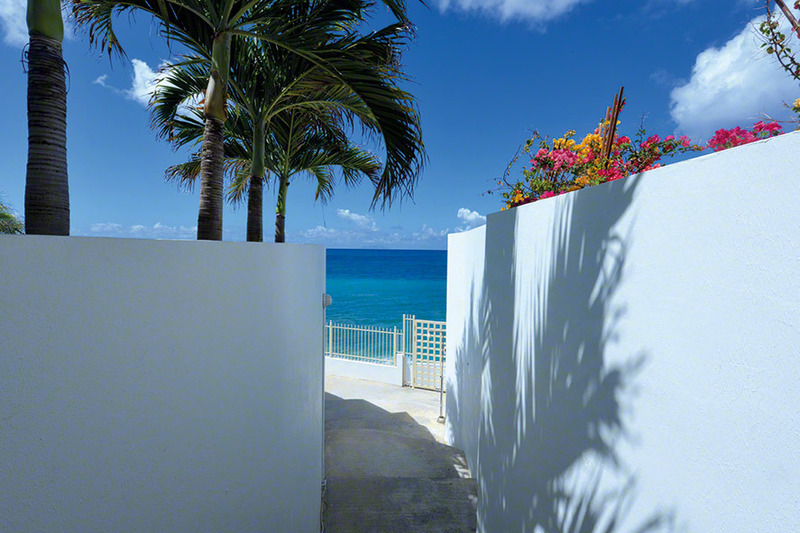 The private terrace expands your view. 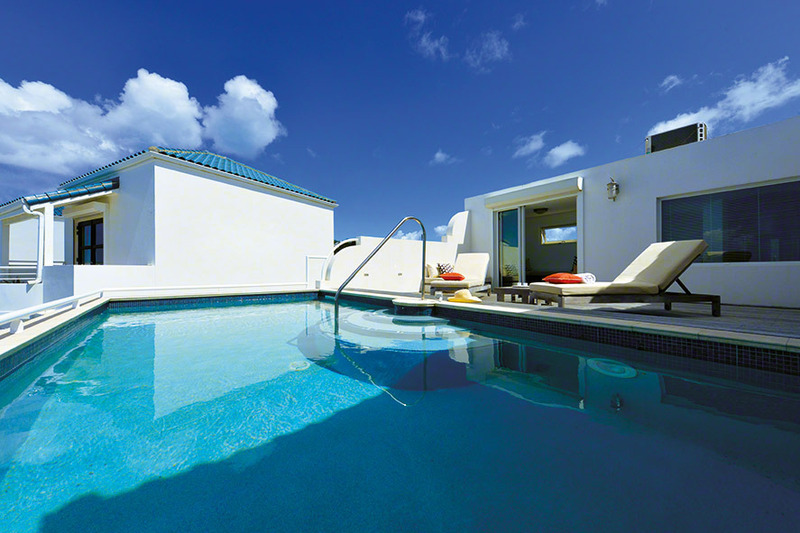 A unique roof top pool is at the other end of this floor. You can almost touch the sky from the super secluded terrace. 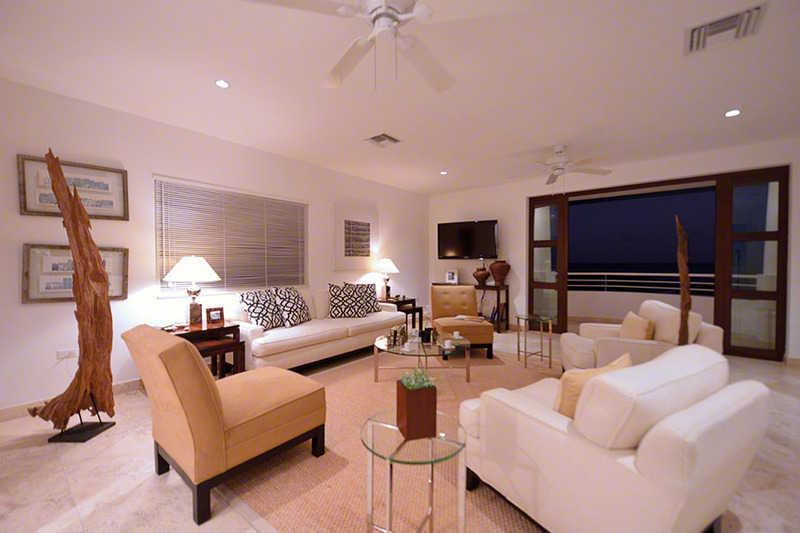 You are very close to amenities and the neighboring beach of Mullet Bay. A short walk from the villa will bring you to the shops and restaurants of Porto Cupecoy. Culinary stars Escape and Temptation are two minutes away as well as the Starz Casino. A further 5 minutes and you find yourself at the International airport or the nightlife of Maho. Traveling over the French Border you are 15 minutes from the Capital, Marigot, where you will find Duty Free shopping, boutiques, bakeries and the Creole Market. 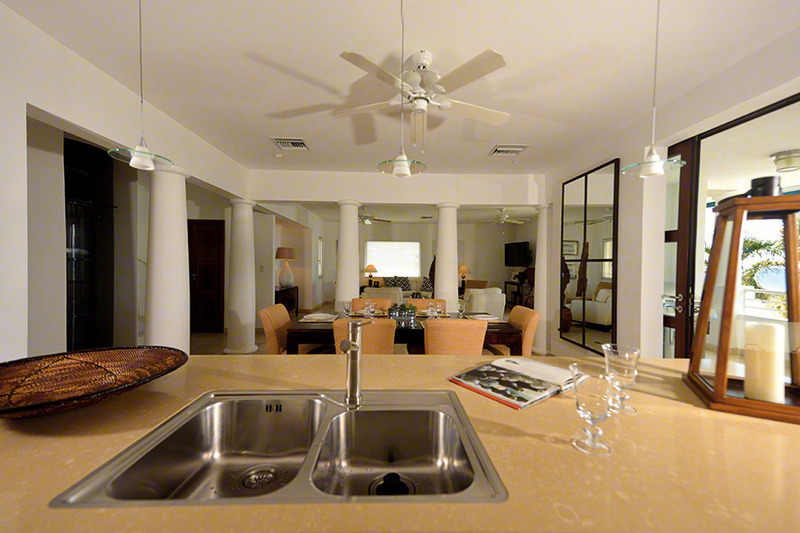 Can be rented as a 1, 2 or 3 bedroom villa. 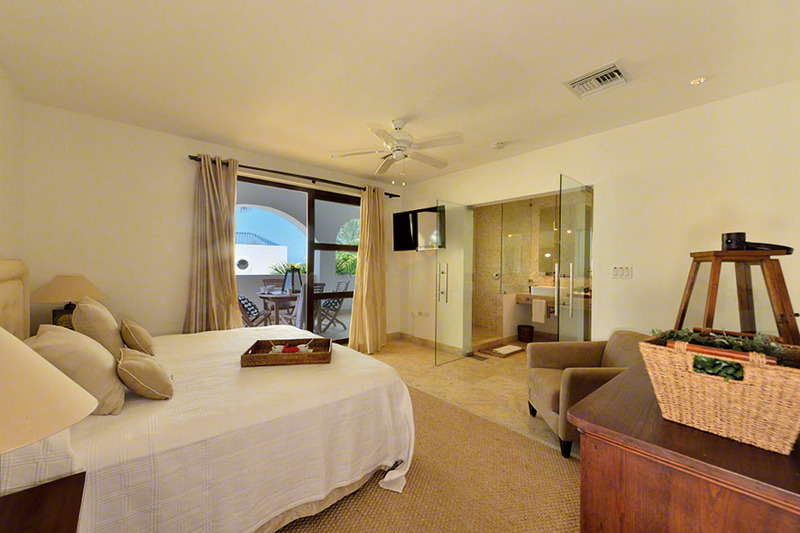 All-bedrooms air conditioned with ceiling fans. Secured lot with electric gate and in room safes. Full orientation of the villa upon arrival. Gas BBQ and grilling area. Check in time 3:00 PM - Checkout time 11:00AM. Villa has washer and dryer access. High speed wifi Internet, voltage 110 & 220. Staff - Gardener, Housekeeper, Pool Service. 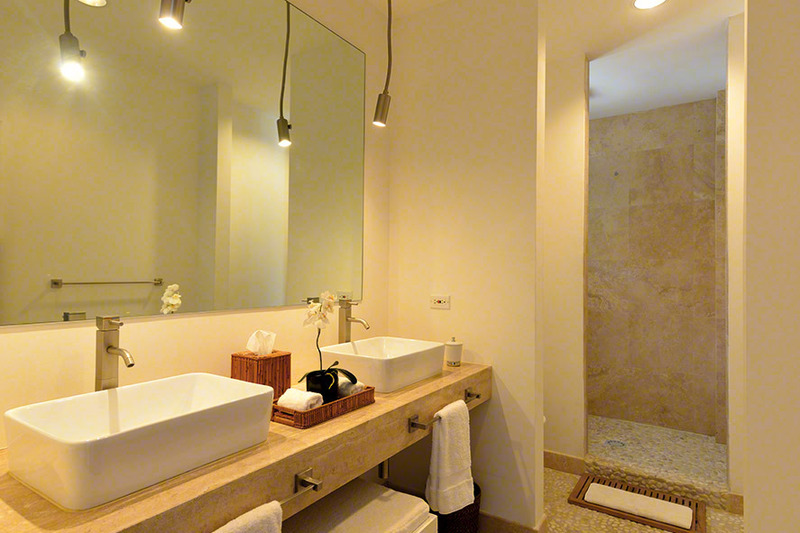 Daily housekeeping service and 24-hour concierge. Out door pool and large pool deck area. 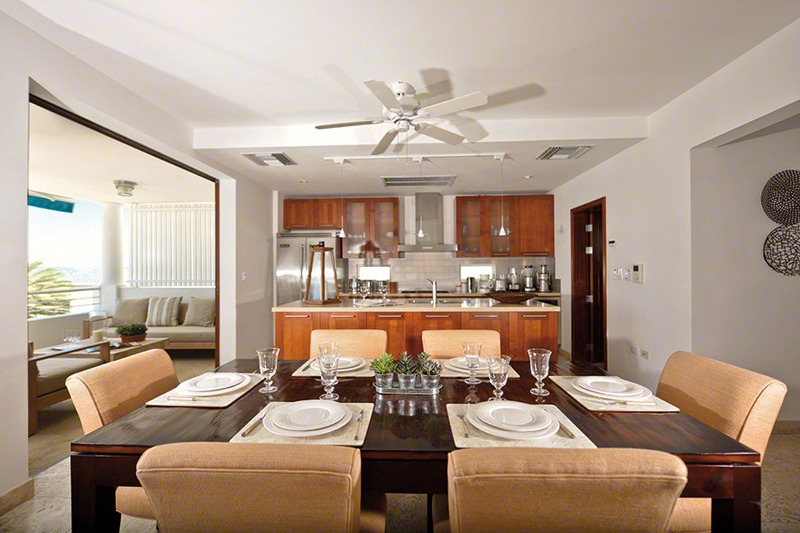 Fully-equipped kitchens with all appliances. 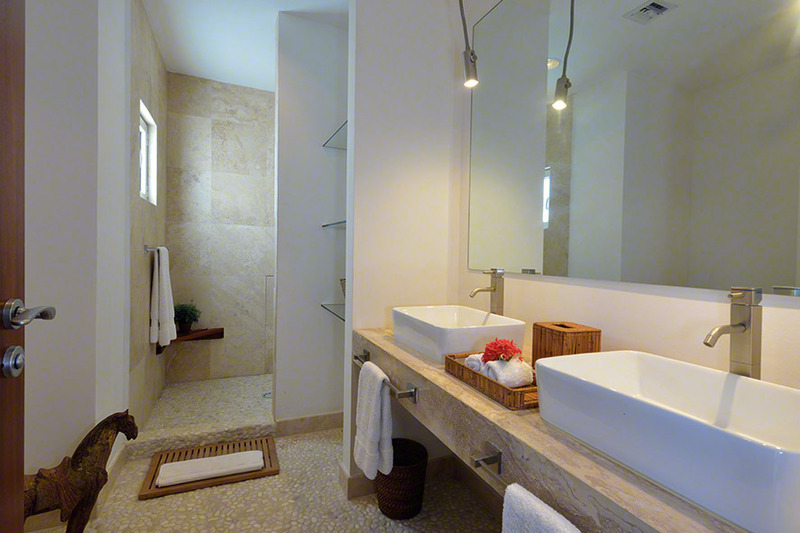 Bathrooms complete with toiletries, hair dryers, towels. Entertainment centre satellite TV, DVD, CD stereo. Private phones can receive incoming long distance calls. Complementary welcome grocery starter package. Car rental services available, delivered to villa. Weekly Rates: (Rates are quoted per week in US$ and are subject to 10% government tax & service) Subject to change without notice.